Captivated by watercolor at a very early age, I found there was something akin to magic in taking a blank sheet of paper, some daubs of color, and making a recognizable image. What a marvelous "sleight of hand" it was and still is! Each of us is surrounded daily by the most amazingly beautiful designs and patterns, but all too few recognize and appreciate this wonder. The artist's job is to identify and interpret for others this beauty, found in the commonplace and the grand. There exists an almost limitless expanse of images created for us and even by us. Watercolor is a lovely and fluid language in which to interpret these ideas and images. Spontaneous and delicate, it offers me constant challenges and surprises. 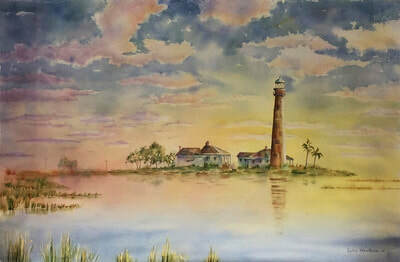 This prize winning artist’s work can be found in private and corporate collections.Her landscapes, florals, and character studies can be viewed at LydiaLtd.com.